Hello, everybody! 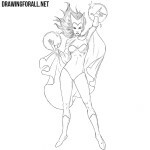 Today we have prepared a new drawing lesson on how to draw comic book characters. And in this lesson we will show you how to draw Nick Fury. Nick Fury – is a character from the Marvel Comics. He was created by Stan Lee and Jack Kirby and first appeared in the comic Sgt. Fury and his Howling Commandos # 1 in 1963. 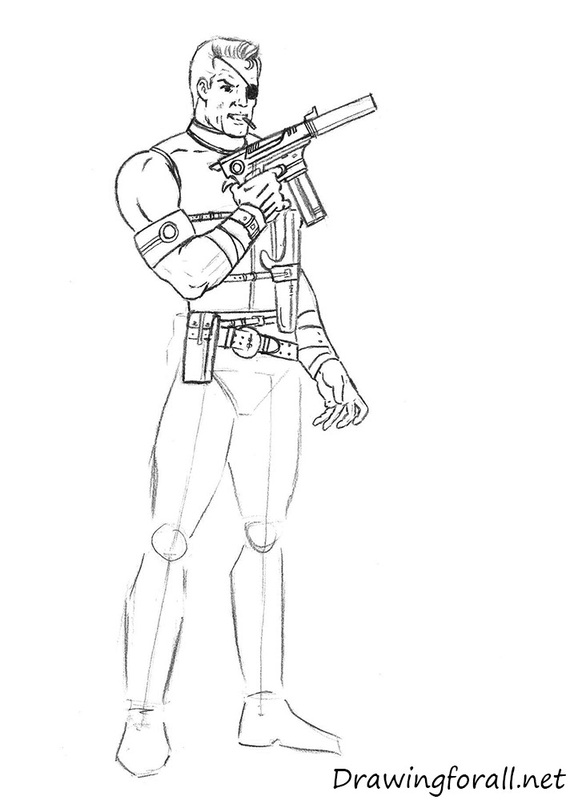 At first we draw the skeleton of Nick Fury. Using and oval draw the head. Using light and smooth lines draw the spine, arms and legs. Note, that the height of man is equal to seven human head heights. At this step we start adding volume to the body of Nick Fury. But first, using some curved lines draw the lines of the eyes, nose, mouth, hairline. Using a cylinder draw the neck. Draw the outlines of the torso. Using circles draw the shoulders and elbows. Draw the arms using cylinders. Let’s add volume to the lower part of Nick Fury. Draw the triangular pelvic, as in the example below. 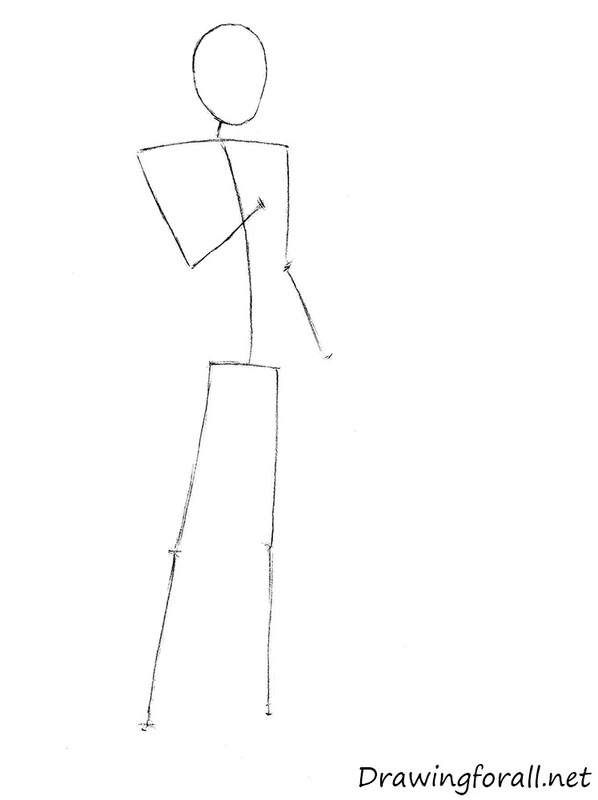 Using cylinders draw the legs. Draw the knees, using circles. Sketch out the feet as in the example below. Using the line of the eyes, draw the eye. Draw a bandage, which is worn on the left eye. Using a curved line draw the brow above the eye. Using the lines of the facial symmetry draw the nose and mouth. Add wrinkles as in our example. Draw the outlines of the haircut. 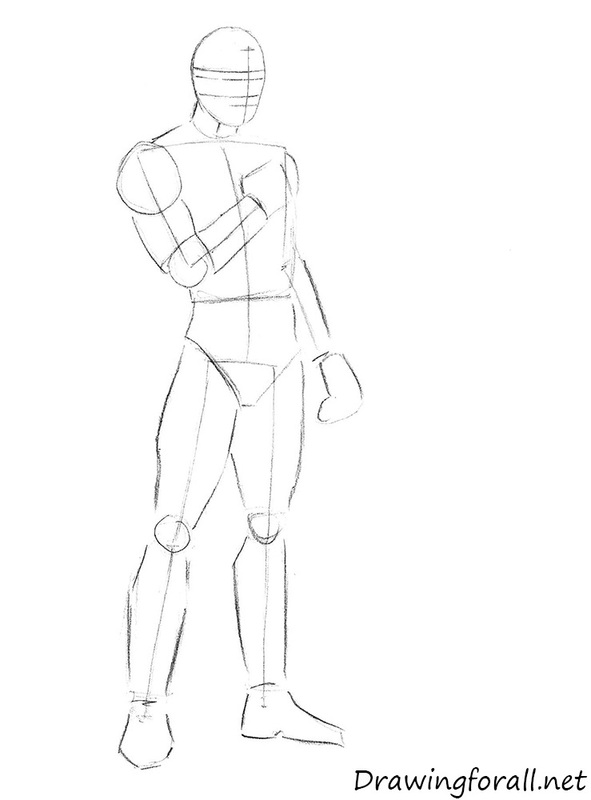 Move down and start drawing the body. At first draw the neck. Draw the lines of the suit on the neck. 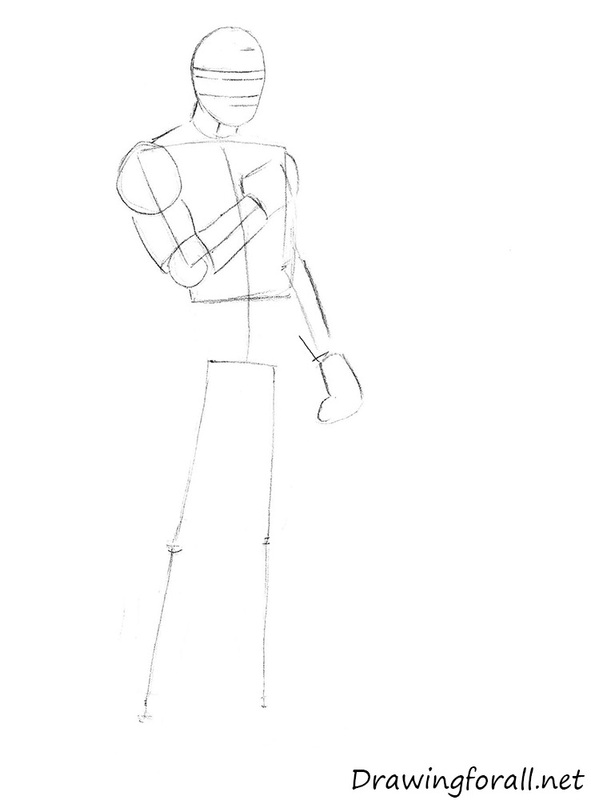 Draw the arms using the guidelines from the previous steps. 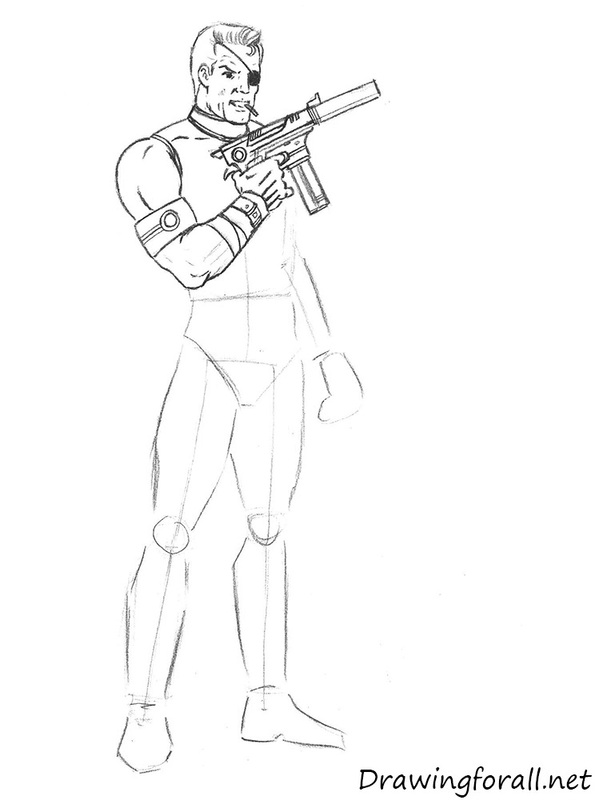 Add the lines of the muscles and lines of the suit as in our example. Draw the gun as in our example, and move to the next step. 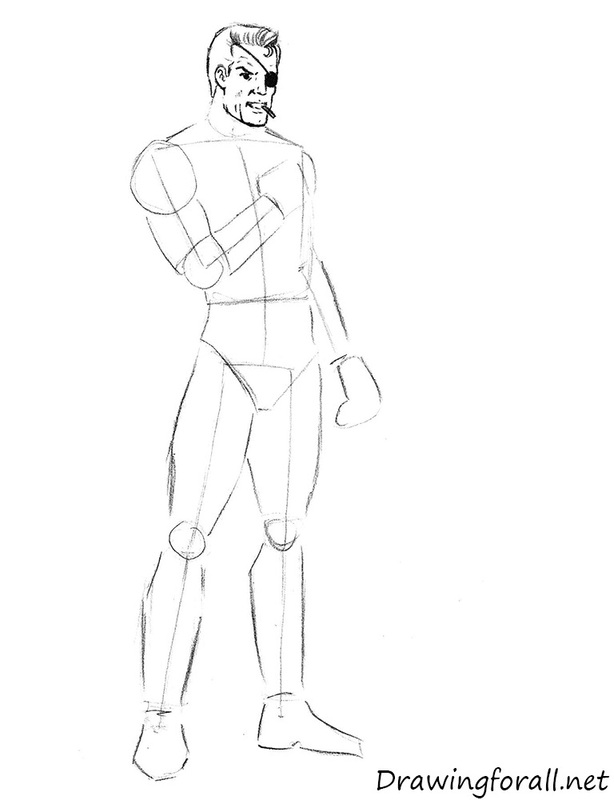 Continue to draw the torso and the left hand of Nick Fury. To learn more about hands, visit our drawing lesson about how to draw hands. 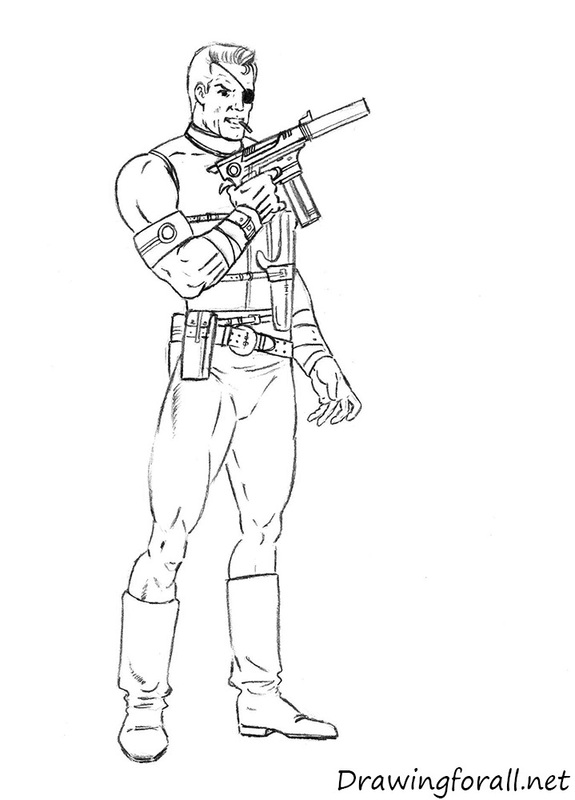 Draw the holster and all straps on the torso and hands of Nick Fury. Now let’s draw the legs on Nick Fury. Like almost all the superheroes created in the 60s, Nick Fury wears a tight-fitting pants, so the leg muscles are visible very well. Draw the muscles of the legs as in our example. At this step we need to add shadows to Nick Fury. First draw the contours of the shadows, and then paint them out. 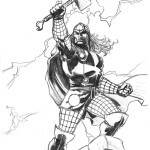 It is classic comic book shadows, such as in the drawing lessons about Wolverine, Spider-Man and Thor. To add loose shadows use hatching. It was the drawing lesson about how to draw Nick Fury by Drawingforall.net. We hope this lesson was interesting and informative for you. 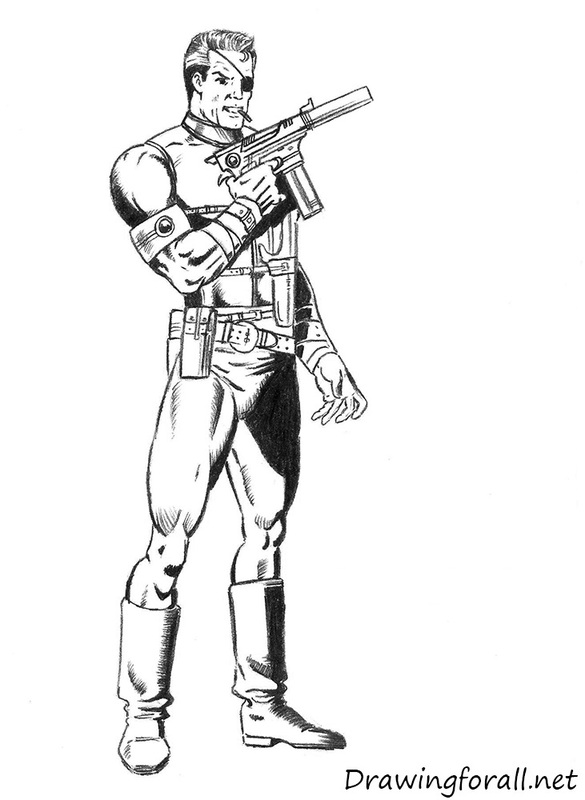 Draw Nick Fury from different angles and in different poses to improve your drawing skills.